Disney's Christopher Robin is a tender, beautiful film that will tug at your heartstrings. You might want to bring a hanky. I struggled mightily not to shed any tears during the opening montage. Director Marc Forster (Finding Neverland, World War Z) brings back the endearing and lovable characters from the 100 acre wood with deft aplomb. While the overall plot of the film is somewhat rote, it packs an emotional punch that's deeply moving. Christopher Robin reminds us of youth's innocence, and the importance of family in difficult times. Christopher Robin is told like a storybook. The opening is a montage of what happens after young Christopher Robin left home to go to boarding school. These initial scenes are extremely powerful. Christopher faces the ugly realities of life, while Winnie the Pooh (Jim Cummings) and his dear friends soldier on alone. The adult Christopher (Ewan McGregor) meets the beautiful and kind, Evelyn (Hayley Atwell). They start a family, but Christopher is called away to fight in World War II. Upon his return, Christopher Robin is a changed man. He takes a job as an efficiency manager at a luggage company. He spends his days toiling at work, forgetting Evelyn and his precocious daughter, Madeline (Bronte Carmichael). Meanwhile, back at the 100 hundred acre wood, Pooh cannot find his friends. He fears they may have been taken by the ferocious heffalumps and woozles. As he is just a bear with very little brains, Winnie decides to find Christopher to help him search for his lost companions. 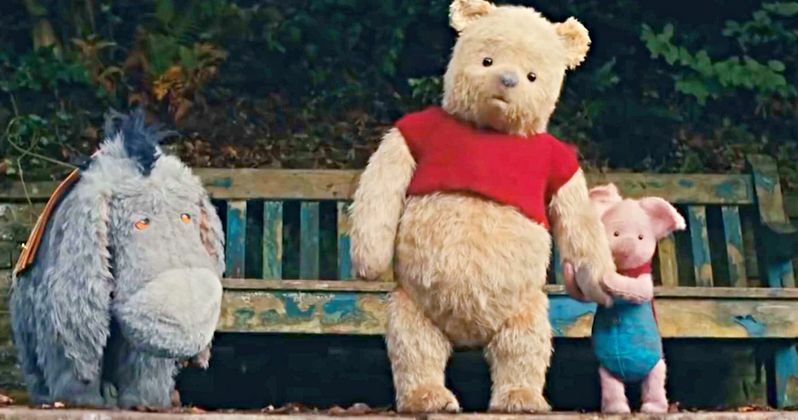 Christopher Robin absolutely nails its depiction of Pooh bear and his delightful coterie. Jim Cummings, who voices Winnie and Tigger, is just fantastic. His perfect delivery of the characters intonations brought me right back to childhood. Brad Garrett almost steals the show as the perennially depressed Eeyore. You will laugh with joy as Eeyore humdrums his way through this adventure. The other characters are superb as well; but Pooh bear, Tigger, and Eeyore are my heartwarming favorites. The synergy between visual effects and the script is key to Christopher Robin's success. The CGI characters are brilliantly realized. They are drawn from the classic cartoons and books, but are also depicted here as slightly worn stuffed animals. They generate a warm response, like seeing your childhood teddy bear for the first time in years. The screenplay by Tom McCarthy, Alex Ross Perry, and Allison Schroeder hits their characterizations with a bullseye. Winnie the Pooh is exactly as expected; from his insatiable love for honey, to his hilarious antics. Kudos to Marc Forster and the production team for getting this right. Audiences worldwide are going to be overjoyed. While Christopher Robin is thematically successful, the plot is ordinary and pedantic. I won't delve into details, but you've seen this story before many times. The film would have been exceptional if the plot had been more original, but the good features far outweigh any narrative issues. The goal here is to mix a heaping spoonful of sentimentality with equal parts nostalgia and love. Christopher Robin is meant to be an emotional journey and it certainly achieves that goal. Parents, I'd recommend getting an early jump on Winnie the Pooh toys. Every kid that sees this movie is going to clammer for them. I hope that Christopher Robin isn't just a slick marketing ploy to sell toys. If so, it totally worked. I'm seriously thinking about buying an Eeyore stuffed animal.